A short while ago, we reported on the news that today marks the 30th birthday of the Mac, and in celebration of this momentous occasion, Apple pieced together a short video clip. But considering how integral the Mac has become not only to Apple’s product range, but also to its identity as a company, there was always going to be more to today than just a video clip. 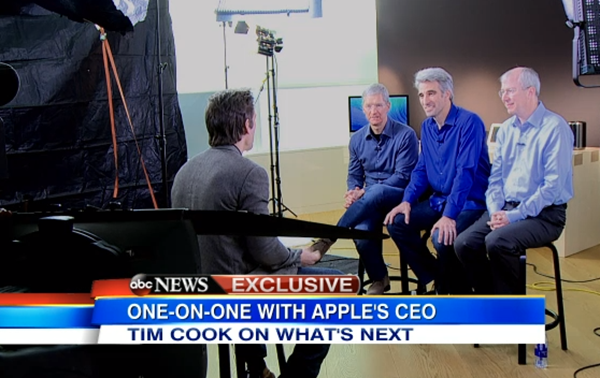 Three of Apple’s head honchos, including the Cupertino’s CEO Tim Cook, have sat down for an interview for ABC News, and although we’ve only a short preview of the full-length piece set to air tonight, it’ll surely be a must-watch for any ardent Apple fan. It’s usually only at keynote events that we get to see the likes of Tim Cook, Craig Federighi and Bud Tribble speak publicly in the same room, so this interview of three of Apple’s most influential characters serves as real treat on this special day. The iPhone maker is, after all, well known for its secretive nature, with such an interview being an extremely rare event, so this full-length feature is not to be missed. Incidentally, Apple’s traditions for keeping ideas and developments under a robust veil of secrecy is one of the topics discussed in the ABC News interview, but that’s not all that’s on the agenda. There is also some discussion regarding plans for a sapphire manufacturing plant based in Arizona, as Apple continues its effort to bring more of the production process away from the likes of China and back to the United States. Naturally, the iWatch is mentioned by the interviewer at one point during the discussion, but in typical Apple fashion, it is almost immediately shrugged off. There’s a real feeling that the company will finally come through with this sought-after piece of wearable tech at some point during 2014, but while it may well be in the offing, there’s no way that Cook and co. would do something as crazy as to hint of it prior to announcement. The preview of the interview can be watched via the embedded video below, and if you do wish to watch it in its entirety, tune into World News with Dian Sawyer from 6:30 PM tonight (Friday).